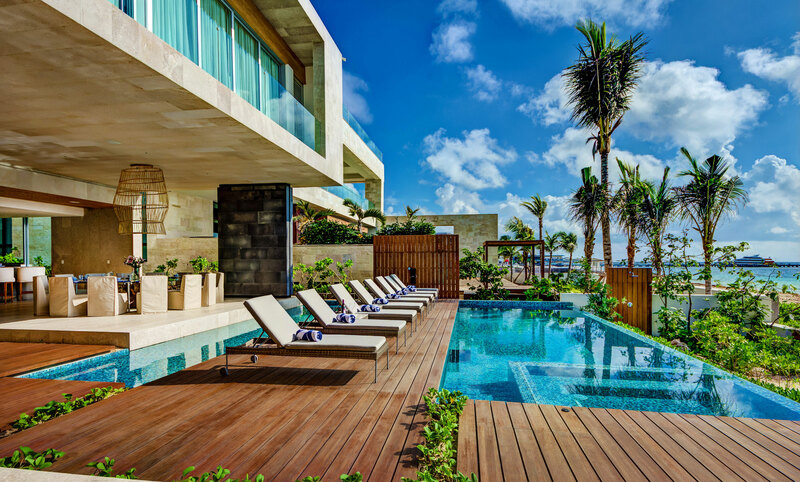 Villa Kin Ich (K’inich), meaning the house of the Mayan Sun God, is a magnificently curated 7-bedroom beachfront villa, architecturally dramatic, blending contemporary style with Mexican-inspired spaces. After entering the private and exclusive gated community of Playacar, it is only a few 100 meters before you find yourself at the stunning entrance of Kin Ich, a private villa oasis. Enjoy the captivating ocean views as you enter through the villa’s lush corridor to find the expansive exterior living and dining areas. Soak in the Caribbean sunshine by the pool or venture out a few steps down to dip your toes in the turquoise Caribbean itself. Villa Kin Ich boasts 7 large bedrooms with the capacity to sleep 20 guests. 3 of the master rooms directly overlook the ocean, and the additional bedrooms feature a garden view. Walking up to the next level, you will feel at the top of the world on this magnificent rooftop, once again mesmerized by the incredible turquoise of the Caribbean . Relax and unwind with some sundowner cocktails taking in the sweet ocean breeze and setting sun. Boasting the best location that Playa del Carmen has to offer, Villa Kin Ich is the only villa that is not only beachfront but has the closest proximity to Playa’s famous 5th Avenue, a pedestrian street filled with an abundance of restaurants, boutiques, international cafes, trendy bars and nightlife. While you will be tempted to venture out for some of Playa’s famous gastronomical experiences, you will also most definitely opt for an undeniably superior culinary experience with our daily chef and butler services. Your Mexican-Caribbean luxury home away from home awaits you.